Peterson, Neal H. (2002) . 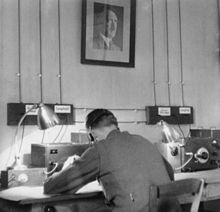 "From Hitler's Doorstep: Allen Dulles and the Penetration of Germany". In George C. Chalou. The Secrets War: The Office of Strategic Services in World War II. Washington DC: National Archives and Records Administration. ISBN 978-0-911333-91-6.